What is an ebook? It's a book in digital form that you read on a computer, ereader, or mobile device. This guide will help you search Cañada's ebook collections, download ebooks, and read them. Through Cañada College Library, students, faculty and staff have access to thousands of non-fiction and fiction ebooks. 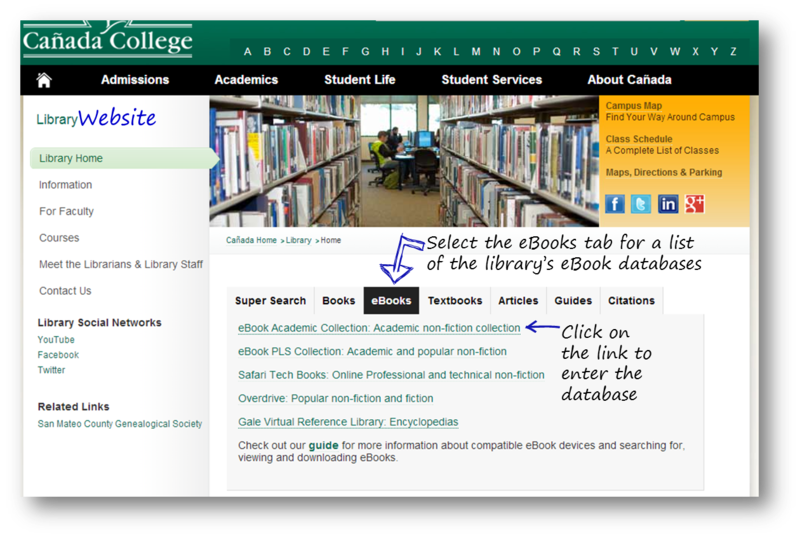 Ebooks can be accessed from the Cañada College Library website. Sign in with your library card number and pin (four last digits of your phone number) to access off campus. Cañada College subscribes to ebooks through different vendors. You can search for ebooks in Safari, Ebsco, and Overdrive. For more information about each of these resources, visit the specific page in this guide. Ebsco ebooks includes class fiction and business, technology, and other academic nonfiction subjects. Check out Gale Virtual Reference to search for chapters from reference books on subjects includingthe arts, business, education, history, law, literature, medicine, multicultural studies, religion, science, social sciences, and technology. You can also find general facts and biographies. Safari provides access to over 5000 technical and business ebooks. Overdrive has fiction ebooks in mystery, romance, literary, and other genres, and nonfiction ebooks in business, finance, biography, and other subjects, and audiobooks in wma and mp3 formats.